Hello and happy first day of October! It sure is cloudy outside my window. Rain is in the forecast for this afternoon so I ran out and took a picture of one of my giant Dahlias. Isn’t it so pretty? I love how this one looks like it has lighting inside. 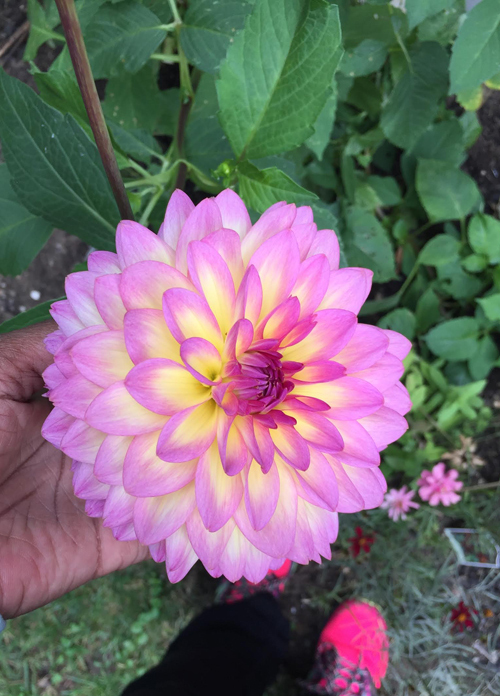 I am definitely going to use this photo of the flower for inspiration when I color up a dahlia image. Had a great weekend. My oldest turned 15 this weekend and I truly can’t believe it’s that long ago I was pregnant with him. Where ever does the time go? We took him out to dinner to a restaurant of his choice and then on Sunday, we went to celebrate with his grandparents. I received a bunch of new craaft products last week so I spent a little time on Sunday testing them out. I will write some posts and show you what craftiness I have been up to. I also spent time reading and finished another book so I need to gather my thoughts so I can write a review. Well, I am going to let you get to your day and get some work completed myself. Previous PostFun Photos Friday: Coloring Time! !